Amateur fishing enthusiasts are always on the lookout for a way to increase the effectiveness of each of our fishing trips. Trying new rods, baits, and fishing spots are all great but to really increase the volume of your catches, a fish finder is extremely difficult to top. Combining traditional sonar with a modern, user-friendly interface provides a new picture of the fishing environment below us. The sonar works by sending an electrical transmission to the transducer which then converts it into a sound wave, which is now your active sonar wave that the transducer then sends into the water and is returned after it comes into contact with a solid object. This information is used to display a clear representation of the fish, terrain, or even foreign objects in the water beneath. Now, if you’re just a part-time fishing enthusiast who likes to head out for the odd weekend or two, then you realistically won’t want to invest large sums of money into a fish finder (they can run into the thousands of dollars). That is why this review looks at one of the most affordable fish finders that are currently available on the market, which is the Venterior Portable Fish Finder. By the end of this review, you should have a better understanding of this unit’s features, pros, and cons, as well as decide whether it is the right fish finder for you or not. The operation of the Venterior Portable Fish Finder is simple for a day in the kayak. All you have are three easy steps for you to be able to detect water depth, fish location, and some cover. 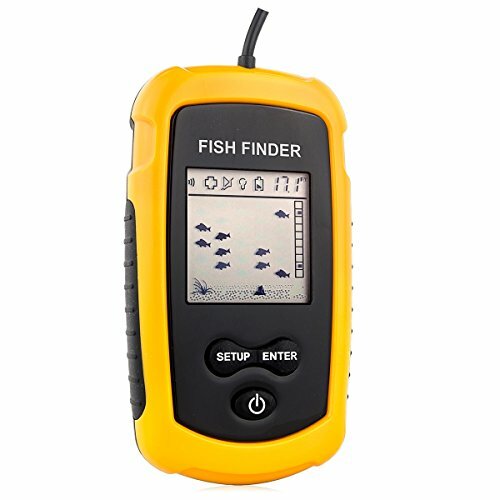 This fish finder also has different settings including five sensitivity levels, a backlight mode, and a battery saver mode. This product is designed to be usable on fresh and salty bodies of water that has a depth ranging from three feet to 328 feet. It is integrated with different units of measure, namely meters and feet, for you to quickly identify how deep the water is. It also has a fish alarm that gets triggered when a fish is near the device. The Venterior Portable Fish Finder comes in at a size of 9.6” x 2.2” x 5.9” and weight of approximately 1.09 pounds, making it very portable. Although it has such a weight and size, trolling behind a boat or a kayak would still be effective because of the transducer’s 25-foot-long cable. Additionally, summer lake fishing or cutting through the ice for some winter fishing can also be accomplished with this fish finder because its operating temperature ranges from -4ºF to 158ºF. The unit also has a sensor beam angle of 45º to provide a more full possible view of the environment below your boat. What is more interesting is that a one-year warranty covers the product and a transducer side-scan adapter is included in your purchase. The Venterior Portable Fish Finder isn’t flush with features which are to be expected for its incredibly affordable price tag; however, it does have what you need to get started in order to catch those few extra fishes. Its transducer comes with a 25-foot cable which makes it great to troll behind a boat or kayak as well as cast out from the shore, helping you gather information from numerous close spots from your single position. The device also comes with a variety of adjustable user settings such as the transducer sensitivity that can be altered depending upon your needs for that trip. Its sensor beam ejects at a 45º angle to provide a wide shot of the environment currently underneath the transducer and even includes a side-scan adapter. This is also a great seasonal fish finder as it will happily operate in different low and high temperatures. When the device detects a fish, a fish icon at its current depth will be displayed. While this won’t help you determine the size or species of the fish, it’s great for beginners who are just looking to increase their catch rate. For those with a little extra in their fish finder budget, it might be worth looking at the Garmin Striker 4. It offers clearer and better-represented information. Users are met with a 3.5” high-resolution display that provides detailed and accurate real time information; thanks to its CLEARVÜ Scanning Sonar, which is designed to create near-photographic images. It also has a water resistance rating of IPX7, which means it can be fully submerged in water up to the depth of one meter for a period of 30 minutes without harming the device in any way. This is a much higher rating than models of similar and occasionally greater price tags. Its maximum depth in freshwater and saltwater reaches incredibly 1,600 feet and 750 feet respectively, making it a great unit whether you would go for a lake, ice, or open water fishing activity. Users can even use the built-in waypoint map to plot up to 5,000 unique waypoints to track their best and favorite fishing locations. All of these features fit into its compact and lightweight design that is incredibly user-friendly with limited dedicated buttons and an intuitive central selector switch for quick adjustments to sonar sensitivity settings. Do expect though that it is a couple of dollars more expensive than the Venterior Portable Fish Finder. The Venterior Portable Fish Finder probably isn’t really for experienced fishing enthusiasts as there are some options available that’ll provide a more detailed readout but obviously require a greater initial investment. Instead, the Venterior is great for those who perhaps have little to no experience with fish finders or fishing in general as its low-entry cost and straightforward operation make it hard not to buy. This is a great little tool that’ll definitely help you improve your catch rate and at the very least introduce you to the world of sonar enhanced fishing.